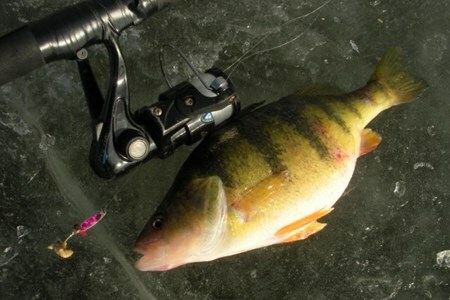 The yellow perch (Perca flavescens) is a very familiar species to most fishermen. This fish was introduced into Montana and is found in abundance in many lakes and reservoirs located ... moreeast and west of the Divide. 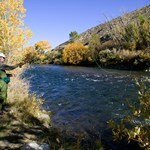 Perch support one of the largest fisheries in Montana and are considered one of the best eating fish in the state. Because of their tendency to travel in schools, perch often can be caught in large numbers, which makes up for their relatively small size and difficulty in cleaning. 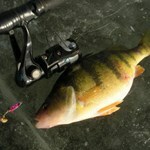 Young yellow perch are important prey for several sport fish. Perch drape strings of gelatinous material with eggs embedded inside over substrate or vegetation. Perch foods are invertebrates and small fish. 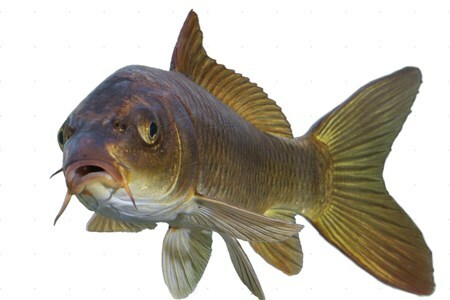 The burbot (Lota lota) is easily recognized by its single chin barbel. 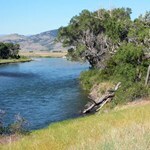 It is native to most of Canada and the northern United States and is found in all three major river drainages ... morein Montana. Burbot, also known as ling, are usually found in larger streams and cold, deep lakes and reservoirs. They are peculiar in that they spawn during winter, under the ice. 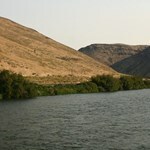 They are also largely nocturnal and have an enthusiastic following among fishermen. 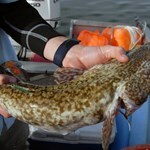 Burbot are voracious predators and opportunistic feeders. 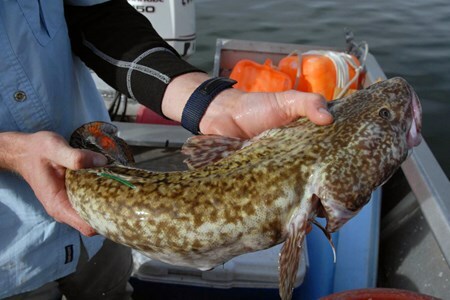 Like other codfish, burbot have livers which contain oils high in vitamins A and D. Despite their unconventional appearance, fishermen rate burbot tops for table fare. 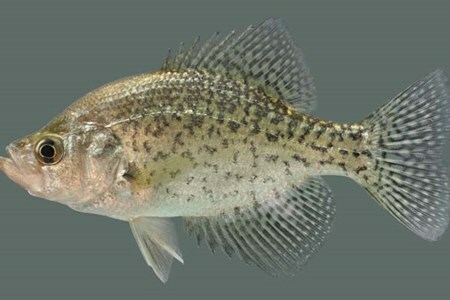 The black crappie (Pomoxis nigromaculatus) is more widespread across eastern Montana than the white crappie with some scattered populations into central and western Montana. 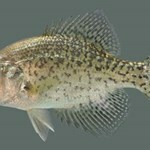 As the ... morename implies, it is darker colored than the white crappie, and has seven or eight dorsal spines instead of the five or six spines found on the white. Crappies are spring-spawning nest-builders like all the other sunfish. Crappies are fun to catch, good to eat, and can weigh up to 3 pounds although 1/2 pound fish are the rule. They are schooling fish and notorious for their love of stumps, debris piles, or other cover.Crappies are spring-spawning nest-builders like all the other sunfish. Crappies are fun to catch, good to eat, and can weigh up to 3 pounds although 1/2 pound fish are the rule. 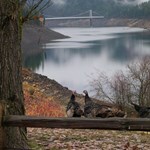 They are schooling fish and notorious for their love of stumps, debris piles, or other cover. 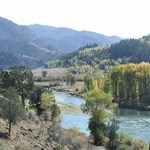 The largest and most important catfish to sport fishermen in Montana is the native channel catfish (Ictalurus punctatus) of the Yellowstone and Missouri River drainages. These fish ... moreprefer warm, muddy rivers and lakes where they forage on just about any animal and some plants, living or dead. 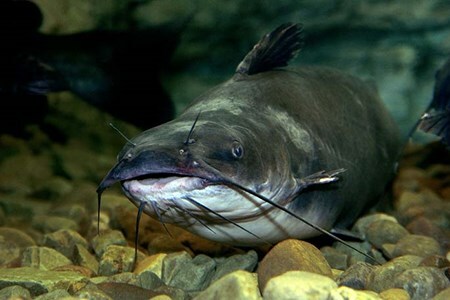 They are excellent eaters and millions of pounds of channel catfish are raised commercially in southern states for that purpose. 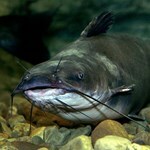 Like all catfish, channel cats spawn in the spring or early summer. The female lays her jelly-like mass of eggs in a nesting site in a dark, protected cavity such as a muskrat burrow, under a stump, etc. and the male guards the nest until the eggs hatch. Biologists have captured channel catfish over 30 pounds in Montana but 2 to 4 pound fish are more common and better eating. The deeply-forked tail separates the channel catfish from the bullheads. 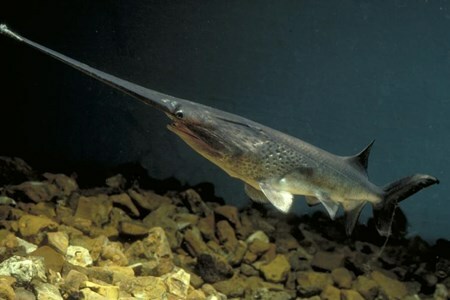 The Paddlefish (Polyodon spathula) is an ancient, mostly cartilaginous fish with a smooth skin. It is a close relative of sturgeons. 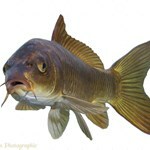 Although it is sometimes called a spoonbill or ... morespoonbill cat, it is not closely related to catfish. 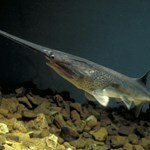 Most species of Paddlefish are now extinct, and fossil Paddlefish from 60 million years ago have been found in the Missouri River basin near Fort Peck Reservoir, Montana. 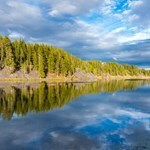 Montana is home to one of the few remaining self-sustaining populations of Paddlefish, and harbors the largest individual fish as well. Specimens have been taken weighing up to 150 pounds. 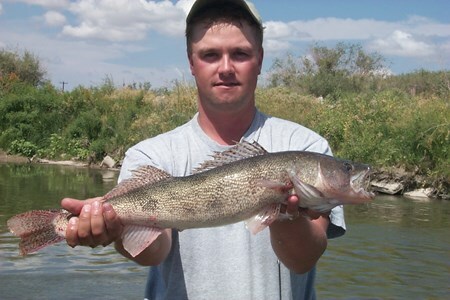 The Sauger (Sander canadensis) is native to Montana east of the Continental Divide. 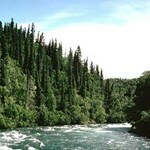 It inhabits both large rivers and reservoirs, but is mainly a river fish. In the spring, Sauger ... morebroadcast their spawn over riffles in rivers. 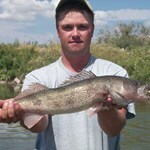 Sauger are a highly prized sport fish and in some areas outside Montana are also commercially fished. 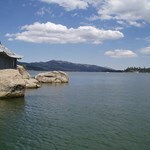 Their major food items are insects and small fish. The smallest and most common sturgeon in Montana is the shovelnose sturgeon (Scaphirhynchus platorynchus). It reaches a maximum weight of about 15 pounds. 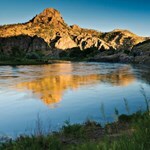 These fish can readily be ... moretaken on bait fished on the bottom and are pursued by relatively few anglers in the Missouri River downstream from Great Falls. Carp are various species of oily freshwater fish from the family Cyprinidae, a very large group of fish native to Europe and Asia. The cypriniformes are traditionally grouped with ... morethe Characiformes, Siluriformes, and Gymnotiformes to create the superorder Ostariophysi, since these groups share some common features. These features include being found predominantly in fresh water and possessing Weberian ossicles, an anatomical structure derived from the first five anterior-most vertebrae, and their corresponding ribs and neural crests. The third anterior-most pair of ribs is in contact with the extension of the labyrinth and the posterior with the swim bladder. The function is poorly understood, but this structure is presumed to take part in the transmission of vibrations from the swim bladder to the labyrinth and in the perception of sound, which would explain why the Ostariophysi have such a great capacity for hearing. The white bass, silver bass, or sand bass is a freshwater fish of the temperate bass family Moronidae. It is the state fish of Oklahoma. 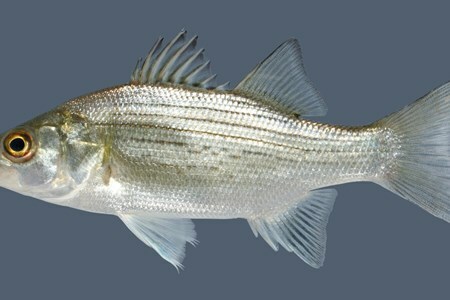 White bass are distributed widely across the ... moreUnited States, particularly in the Midwest. They are very abundant in Pennsylvania and the area around Lake Erie. 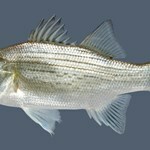 Some native ranges of the white bass are the Arkansas River, Lake Erie near Cleveland, Ohio, and Lake Poinsett in South Dakota; they are abundant in the Winnebago lakes system of Wisconsin and they are also very abundant in Oklahoma. 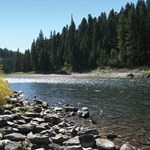 White bass have also been found in rivers that flow to the Mississippi. 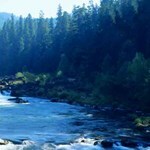 Native to many northern habitats, they have been introduced in many different waters around the United States, particularly in southern locations. They were also successfully introduced to Manitoba starting in the 1960s, where they have gained importance as a sport fish. 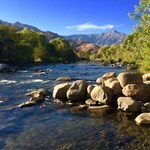 Steelhead are a native type of rainbow trout that are anadromous. Anadromous means they spawn in freshwater streams, go to the ocean to grow, and return to fresh water as adults. 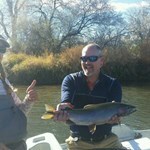 Fishing ... morefor steelhead typically occurs from October through March. 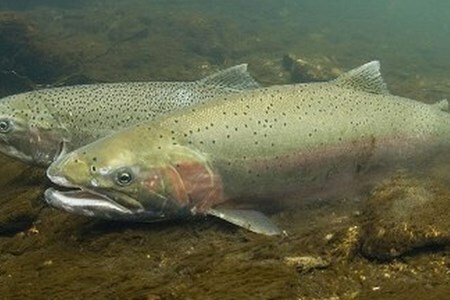 When they mature and are ready to spawn, the steelhead migrate back to the place they were born. 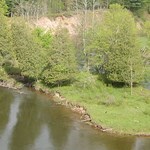 They enter the lower river drainages in the fall (Sept.-Oct.) and winter over to spawn the following spring, which allows a fall and spring fishing season.Most require 3 to 5 years to mature. 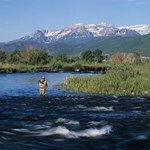 Steelhead respond to a variety of angling techniques. 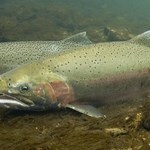 Since they are not feeding as they wait to spawn, the angler pesters the steelhead enough to get it to strike. They're aggressive and will take a variety of bait, lures, and flies.